Using paper to create paper art jewelry lends itself to a wide variety of techniques to be folded, cut, glued, molded, layered and more. This allows for many styles of fashionable paper jewelry creations, including bracelets, necklaces, earrings, brooches and many other designs. The following information will guide you in choosing the right types of paper and adhesives for your paper bead jewelry-making projects. Selecting the type of paper to use is a matter of personal preference; just make sure to choose paper that can hold a crease. Paper styles can range from traditional or contemporary, calm or extravagant and graceful or quirky. Although you can experiment with an array of paper, Washi ("wa" meaning Japanese and "shi" meaning paper) is the traditional paper used to create origami and is a type of paper made in Japan by using wooden fibers. It is more durable than ordinary paper made from wood pulp. 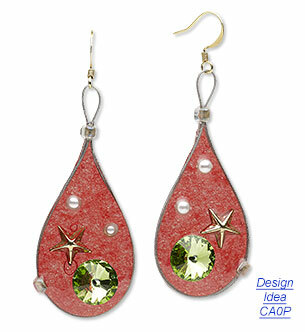 Two adhesives are suggested when creating paper art jewelry. Mod Podge® is easy to use, holds tight and dries quickly and clear with a high-gloss finish. The Vibrance Paper Bead Glaze is also a great adhesive as it is easy to use, dries in one to two hours, creates a smooth finish, enriches the color of paper, offers water resistance and provides a glossy finish. ICE Resin® is another type of medium to use when designing with bezels, creating a clear dome as it covers and magnifies the origami paper beneath it. ICE Resin is two-part formula that dries and stays crystal clear, without yellowing or breaking down. With the range of design possibilities, you can transform several types of beads--including metal, ceramic, gemstone, bone, horn, wood, crystal and more--into a jewelry work of art. Trim the paper into the desired shape. For round or oval beads, cut the paper into strips. This will ensure the entire bead is covered. 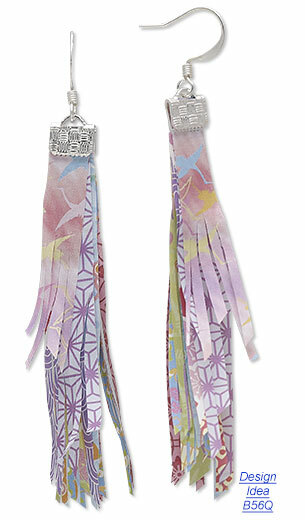 Using a paintbrush, paint a thin layer of Mod Podge or Vibrance Paper Bead Glaze onto the paper. Experiment and choose which you prefer. Lay the paper over the bead, smoothing it down as you go. Continue to paint on the adhesive and lay down the paper until the bead is covered as desired. 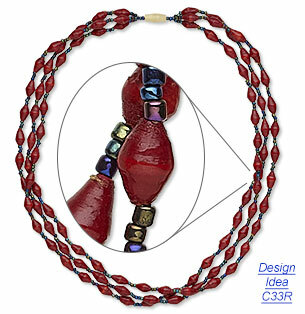 Depending on the size and shape of the bead, you may find it easier to finish at the holes in one of two ways. The first option is to dab glue inside the holes and, using a toothpick, or other slender object, poke the excess paper down into the holes. When smooth, paint on more Mod Podge or Vibrance Paper Bead Glaze to seal. The second option is to paper over the holes, allow the adhesive to dry and then poke through the paper with a toothpick or other similar object. Again, poke the excess paper into the hole and seal with adhesive. 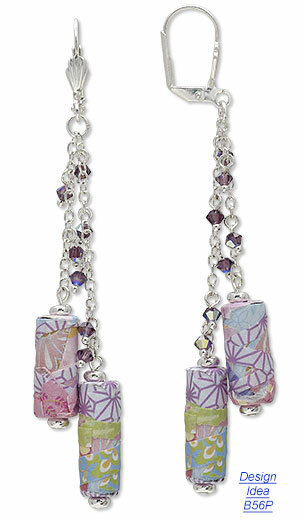 You can also dip the beads into Vibrance Paper Bead Glaze. Run a toothpick or straw through the hole and balance the bead on the lip of a cup to dry. 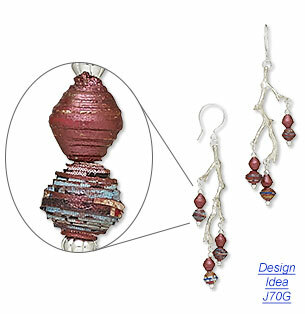 View more paper bead design ideas in the Gallery of Designs. Cut the paper into the desired shape. If desired, embellishments can be added into the center of your finished design, such as seed beads, rhinestones, mother-of-pearl flakes, decal letters and more. If designing without a bezel, temporarily use a piece of wax paper cut to fit the inside dimension of a bezel. This temporary wax paper edge can be removed once the ICE Resin has set. If embellishments have been chosen, place them into your bezel. Following manufacturer's directions for ICE Resin, pour 1/4 ounce of Part A into a mixing cup then pour 1/4 ounce of Part B into the mixing cup. Using a stir stick and a gentle folding motion, blend the two parts together. Mix for at least 2 minutes. As you mix, scrape the sides and bottom of the cup to make sure all parts of the liquid are mixed together. Blend until the ICE Resin is clear and no striations or bubbles are evident. Carefully pour the ICE Resin into the bezel, trying not to disturb any of the additional embellishments. Pour until almost full. Let the ICE Resin settle and see if you are happy with the height of the liquid. If you want a domed surface, pour the ICE Resin until the bezel is almost full and let it set for approximately 5 hours, then mix and pour a second layer. This layer will not only create a domed look to the finished design but also offer a magnified view. Check the ICE Resin for bubbles. Place a task light close to the bezel to help bring any bubbles to the surface. If any appear, use a toothpick to pop them as they reach the surface. Let the bezel sit, undisturbed, overnight. 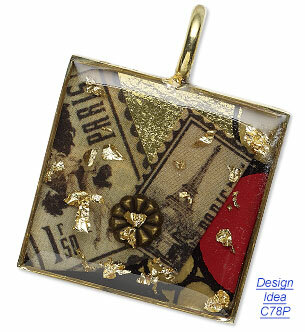 View more paper and ICE Resin design ideas in the Gallery of Designs. For more detailed instructions view the FREE ''How To Use ICE Resin'' how-to video with jewelry-making expert, Tammy Honaman. Origami ("ori" meaning folding and "gami" meaning paper) originated in the 6th century and is the traditional Japanese art of folding paper into decorative animal and flower-like forms. This art form continues to evolve beyond traditional origami with techniques including wet folding origami, strip folding, modular origami, chain origami and more. Origami is an incredible artistic medium and an enjoyable way to turn single or multiple pieces of paper into a three-dimensional art form. Today, this artistic medium can be made into beautiful handmade paper jewelry, including earrings, bracelets, brooches, necklaces, hairpins and more. View more origami jewelry design inspirations here.